UPSC Engineering Services Admit Card 2018: Get UPSC Engineering Services Admit Card for UPSC ESE Main Examfrom here which has been out now. Union Public Service Commission has all set to conduct UPSC Engineering Services Mains Exam on 01st July 2018. Participating contenders in Engineering Services (Main) Examination, 2018 can download their UPSC ESE Mains Exam Letterfrom this page or through official website that is upsc.gov.in. Other details about UPSC Admit Card 2018 are provided below. UPSC Engineering Services (Main) Examination – 2018 is going to be held on schedule date given here at various Centres/Venues all over India. To get your UPSC Engineering Services e-Admit Card, you must fill registration ID and Roll number and download UPSCJuly Exam Admit Card. UPSC Engineering Services Admit Card 2018 contains the following information such as candidates’ name, venue, and exam date etc. For more information about UPSC 2018 Admit Card, you need to go through this page of www.privatejobshub.in. How to Download UPSC Engineering Services 2018 Admit Card? Now, move your cursor toward “What’s New” section from right side and hit on “View All” link. Then, press “e - Admit Card: Engineering Services (Main) Examination, 2018” link to download UPSC Engineering Services e-Call Letter. After hitting above mentioned link, a new page will be displayed and showing some Important Instructions, go through it and hit on “Yes” tab. Now, you have to select any one option as shown below to get your upsc.gov.in Admit Card. If you select this option, you have to fill asked details like Registration ID., Date of birth and Random Image. After filling asked details, hit on “Submit” button and your UPSC Engineering Services Mains Exam Admit Card will be appeared. At last, you can download UPSC Call Letter and keep it safe for appearing in UPSC ESE Exam. 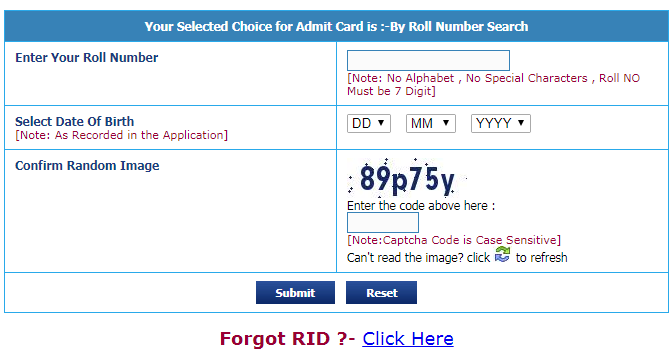 For this option, you have to enter your roll number, Date of birth and Random Image, as depicted here. After entering the asked details, you need to hit on “Submit” button as given in the image. Your UPSC Engineering Services Mains Admit Card will display facing you. Lastly download it and take a hard copy of UPSC Engineering Services Exam Admit Card. Black Ball Point Pen as the candidates shall be required to fill the Attendance List with Black Ball Point Pen only. What will be the further process? Applicants, who’ll qualify the Engineering Services Mains Exam, are only eligible to appear in UPSC ESE Personality Test. The Interview Session will be of 200 marks. Aspirants, who’re going to appear in Mains Exam, they can download their UPSC ESE Hall Ticket from this page by following above mentioned steps or access the above provided direct link. Applicants may visit its official link to download additional information about UPSC Engineering Services Admit Card 2018.